Why didn’t a cab driver think of Uber? Why didn’t Barnes & Noble think of Amazon? Why didn’t Blockbuster think of Netflix? Why didn’t Marriott think of AirBnB? The answer to all four, and the myriad other companies displaced by digital disruption, is that at some point, you established a cash cow—a product or service that generates the majority of your income and profits—and you spent years and even decades building a successful business around it designed to not only grow, but also to protect and defend it. The fact that most of us are all so busy and so focused, coupled with the ongoing need to meet or exceed your quarterly numbers will keep you from looking far enough outside of your business and industry to see the disruption ahead. When you can anticipate a disruption before it happens, you now have a powerful choice. You can either be the disrupter or the disrupted. You can use predictable Hard Trends to create the new cash cows that will disrupt your competitors and grow your future. It’s important to understand that disruption can either bring opportunity (if you get there early)—or disaster (if someone else does). I won’t spend time now covering how to separate these two types of trends in this blog because I have written extensively about this over the years as well as covering the methodology in my New York Times bestseller Flash Foresight. A key to success for an established company that’s facing the early stages of being disrupted is to adopt a strategy of embrace and extend. Kodak spent over a decade and millions of dollars protecting and defending their film based photography business. Unfortunately, Kodak, along with Polaroid and many others, saw digital photography as a Soft Trend that could be protected and defended against, but as I identified in the 1980s, and as we all know today, it was a Hard Trend that could not be stopped or defended against. Two years before Amazon was founded, I was launching one of my books Technotrends at the American Booksellers Association National Book Expo where there were 10,000 bookstore owners including Borders and Barnes & Noble. In a speech I delivered at the convention, I said “In two years there will be a virtual bookstore.” I also said “Any of you could start a virtual bookstore today because the tools are there to do it, but I think it will be someone from the outside because you are all too busy selling books.” The rest is history. My point is that disruption is there to see when you identify the Hard Trends shaping the future—and not taking action on a future fact will impact your business regardless of your size. Another key reason for missing digital disruption is assuming that it won’t happen to you and your business. Today, there are many industries that are ripe for digital disruption and when you take the time to look outside of your industry at the Hard Trends that are shaping the future, you will be amazed at what you can see. As you look at your business, are you looking outside of it as well? What are your blind spots? What fundamental assumptions about the “way things will always be” do you operate on? What are you doing to become your own disruptor, so you aren’t left in the dust? What is a hotel? What is a taxi? What is a bookstore? Companies like Marriott and Barnes & Noble, not to mention government agencies like New York’s Taxi and Limousine Commission, thought they knew the answer to those questions. Consider how fast the mobile web has changed how we all live, work, and play. The sudden instant, massive connectivity of the mobile web enabled the “sharing economy,” and the democratization of all commodities. You don’t have to be a hotel to be in the accommodations business; you just need a bed and a smartphone. The massive hotel chains had so much more than that, but they blew it because they were jealously guarding their cash cow, instead of using Hard Trends to create the next disruption. When you let your ideas about consumers calcify and stop adapting much less anticipating, that’s when you start inadvertently digging your own grave. “Well nobody will ever want to buy a book without human contact, so let’s keep building stores,” said Borders, may it rest in peace. Borders could have survived and even thrived if they would have embraced the Hard Trends shaping the future and focused on reinventing the retail experience. Unfortunately, they focused on protecting and defending themselves out of business. One of the biggest common threads between the businesses that have been disrupted is thinking that your business is immune to changing circumstances. The fundamental assumptions of so many businesses—people will always stay in hotels, people wouldn’t trust strangers to drive them around or lend them a place to stay—have turned out to be wrong. 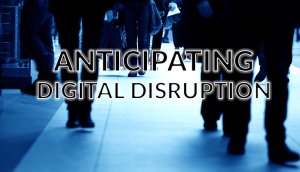 Begin thinking about other emerging digital disruptions: the wearable web (smart watches and much more), the drivable web (smart semi-autonomous cars), the domestic web (smart homes), and so on. What does that do to your industry? If you think the answer is “nothing,” I encourage you to think twice. You need to become your own disruptor, your own best competition. Don’t get comfortable. Disrupt yourself, or someone else will.